Then they are definitely honeybees and beekeepers will collect them. So click below to find a beekeeper near you. For other areas click: here. 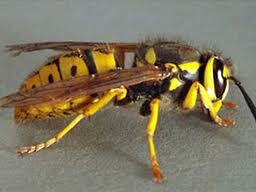 If however they look like the picture below, they are wasps and beekeepers do not collect these. They are good for the garden as they feed their brood on greenfly etc… But if they are a nuisance, a pest control officer will deal with them or you can buy a ‘Wasp Spray’ from a hardware store, B & Q or Homebase and spray the foam at the entrance of their nest. If your bee looks like this, they are bumblebees. 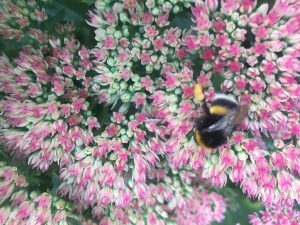 Bumblebee on a sedum courtesy John Farrow. 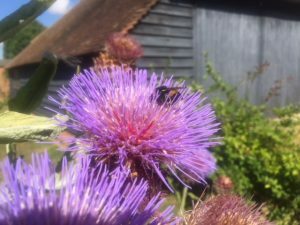 Bumblebee on Artichoke, Courtesy John Farrow. They very rarely sting and if you have a nest it will only last a couple of months for all their brood to hatch. 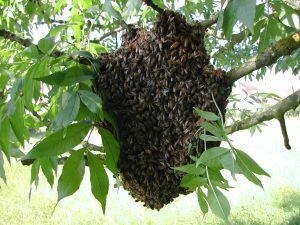 However if they are causing a problem and they are reasonably accessible, beekeepers may re-locate them subject to discussion. who have been negotiating a new home, which could be in a chimney, under roof tiles or outbuildings. If they take up residence in your home this would involve scaffolding and a great deal of time and cost to get them removed!! To see what’s involved click on Bees in Buildings. So to avoid this risk, contact the nearest collector from the list below. We usually make a charge to cover our petrol expenses and time. 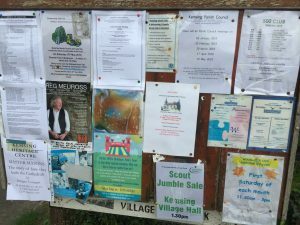 Normally we charge £20 callout as this could involve returning in the evening to collect the flying bees, but this is open to discussion with the collector. If you cannot contact the one nearest to you, then go to the next nearest on this list. 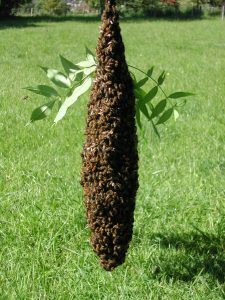 Be patient, because during the swarming season all of us may be very busy collecting swarms! 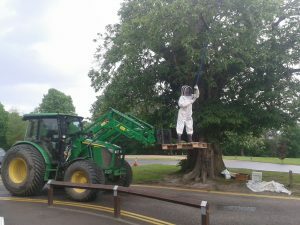 Using an extended swarm catcher and standing on a raised pallet, it appears nothing is too difficult for one of our Intrepid Sevenoaks Team! !